The Barrington Cultural Arts Center (BCAC) is an all volunteer, not-for-profit, 501 (c)(3) organization made up of local artists. BCAC fosters a community of local artists and to promote exhibition and teaching opportunities for all of us and to share in the efforts needed to do so. We also want to help create fun, cultural activities in our town for everyone to enjoy. All visual and functional art media are welcome – sculpting, painting, jewelry design, stained glass, mosaics, cartooning, etc. Learn more at their website: www.barringtonculturalartscenter.org. Created by Chicago-based, internationally-shown artist Barbara Cooper and our community, through a series of workshops, using recycled materials donated by area residents and organizations. Inspired by trees and forests, libraries and communities, and our ever-deepening understanding of how all of life is networked together. Co-commissioned by the Barrington Area Library and the Lake Barrington office of Bartlett Tree Experts. 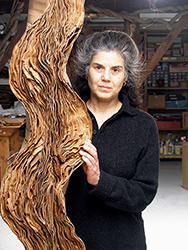 Barbara Cooper works fluidly between sculpture, drawing, and public art. She has developed gardens and structures for dance and theater. Depending upon the objective of the project, she utilizes diverse media such as wood, metal, paper, glass, and found objects. Revealing an ability to manipulate solid material in a fluid manner, forms reference movement and growth. The work is biomorphic in style and process driven, growing from the inside out. Imagery evolves from paring down forms in nature to their essentials, finding common denominators, eliciting references that blend categories or genre. Utilizing repurposed materials whenever possible, issues of sustainability and an ecology of wholeness are embedded in her work. 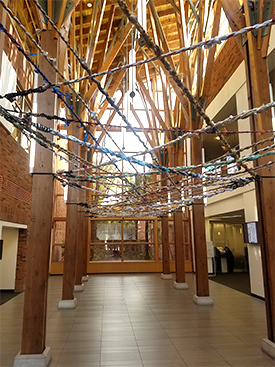 The branched wooden columns of the Barrington Library’s soaring atrium generated a strong reference to the hallowed space of a forest, as well as to Peter Wohlleben's book The Hidden Life of Trees. The book reveals what we cannot see: that is, how trees within intact forests function as a unit as they communicate through beneficial fungi living symbiotically at the root tips. In a similar way, a library develops a mutually beneficial relationship with its community. The Barrington Area Library is sited next to a forest and is a strong connector in the village in which it functions, connecting different categories of information and knowledge with various populations of people. For the making of Network, used materials were collected from the community to be repurposed into ropes. Materials included: video and audio tapes, fabrics, string from hay bales, drawings and posters, etc. The process of making these ropes with different people coming to the workshops was an opportunity for participants to network with others in the community. Ron Johnson has been taking photographs for most of his adult life. In 2013, he upgraded to his first DSLR camera. This is when he started learning more about photography and composition. Ron likes being outdoors and taking pictures of landscapes and architecture. Ron is a retired Firefighter and now works security at Barrington High School. Ron lives in Barrington with his wife Jean. The canvas prints on display are all 20" x 30" and available for purchase. To inquire about a purchase or for more information, please contact Ron via email at johnson5135@aol.com. Inverness artist Ju Young Do uses oil paints and deep colors to create her art. The artist has both a B.A. and an M.A. in Fine Arts from College of Arts, Ewha Womans University, Seoul, Korea. She has shown her works in both solo and group shows in the United States and internationally. 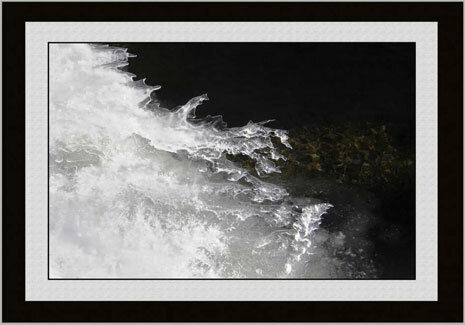 "Water has been an object of intense fear to me since childhood when I almost drowned to death in the rapids. I used to express water in dark colors and gloomy atmospheres reflecting such psychological traumatic memories. As time passed by, the images of water reflecting death and fear became thinner and another image emerged from the darkness. As I got older, I often fell into thoughts while staring through water. When I felt exhausted from the everyday job as a mother of three, water reflected not only my thoughts, but also drew other worlds on the surface. Calm and peaceful water healed my fatigued body as I wanted to meditate there and enjoy peace of mind. This inspired me to mirror the ripples of the shiny water through the paintbrush gliding through the canvas. I wish that my works would portray a quiet meditation and peace to anyone in the audience who is suffering from a strenuous life. My artwork represents how the water slowly became the Holy Water to heal my disturbed mind." See a list of works and contact information. The Artistic Forest: Works inspired by "Network"
South suburban artist Richard Schmidt has been painting for more than 40 years, showing primarily in Illinois, Indiana, and the Hudson Valley region of New York. I have always been fascinated with painting nature and those things not quite permanent. I personally see spiritual significance in the density and feel of matter-there is something timeless, immortal about it-whether a rock, tree, water, a bowl of fruit, or an old barn falling down on itself. These things have texture, dimension, and a soul. Trying to express the three-dimensional world on two-dimensional canvas is a daunting challenge. This is my aim with every new painting. Using oils, I primarily use landscapes and still life to study and interpret reality because one can look intently at and study objects that, on a whole, do not move. My most satisfying results come from losing myself in the subjects that I paint. In a sense, becoming the subject. Capture that color, see the sunshine, walk into those woods, feel the cold, the texture of the rock, hear the music of the babbling stream, enjoy the warmth of an autumn day. 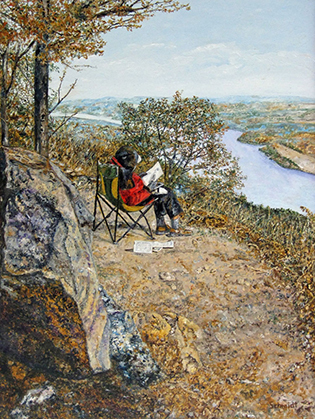 I interpret the colors and light using a wet-on-wet technique and a modified pointillism style. The light playing on the subjects and their environment is the real inspiration. 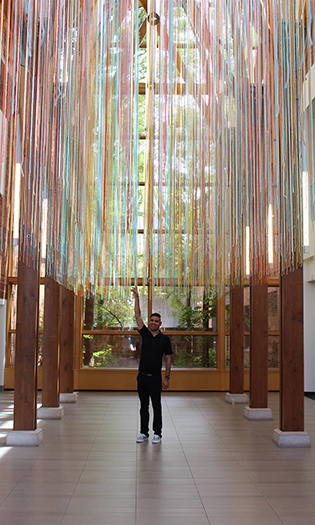 Minnesota-based, internationally-known artist HOTTEA describes his work as “interacting with public spaces non-destructively.” HOTTEA, whose full name is Eric Rieger, has created an original work of art, "Elaine," commissioned by the Library for its beautiful atrium. The work may be viewed during the Library's regular hours. 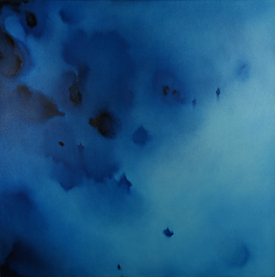 Rieger's work has been seen on the streets of Chicago and Minneapolis-Saint Paul, on the stages of New York Fashion Week, at musical experiences like the Eaux Claires Festival and a series of concerts by Bon Iver at the Sydney Opera House, and on the sands of Ala Moana Beach in Honolulu. He has even appeared on Sesame Street and worked at Paisley Park to honor the passing of Prince. His work will be on display at the Barrington Area Library through summer 2017. A graduate of Carnegie Mellon University in Pittsburgh, PA, Potter has taken additional classes at Harper College and the School of the Art Institute in Chicago. She has also attended various workshops in Canada, France, and the United States. Basically a printmaker, Potter utilizes the techniques of etching, engraving, wood cuts, and the aquatint technique in etchings. Her other main interests are watercolor, collage, and more recently, icon creation. A retired adjunct faculty member of Harper College, her teaching experience includes oil painting, watercolor, monotypes, mixed media, papermaking, silk painting, drawing, and encaustic painting. She has also taught many classes at the Arlington Heights Senior Center. Potter has been in many art fairs and exhibits over the past 25 years, and a member of many prominent art guilds and societies. See a price list of Veronica Sebastian Potter's works currently on display at the library. 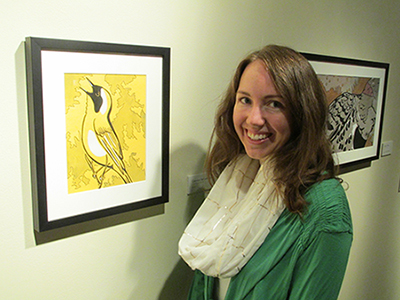 In this series of paintings, artist Catherine Game depicts birds seen in Chicago. She uses homemade paints from sustainably sourced materials such as vegetables, spices, and soils. Although the lines in her drawings appear abstract, they actually represent the bird’s song. Golden spheres float amidst the song noting that species’ high count, as documented by local birders through the Cornell Lab of Ornithology’s signature citizen science program eBird. Inspired by the nature that surrounds her, Game aims to illustrate the wide diversity of birds found in the city. She hopes to bring visibility to what is often lost in the midst of urban distractions. Game lives in Chicago, has a B.A. in art and biology, and a Masters of Science focused on environmental behavior, education, communication and the arts. 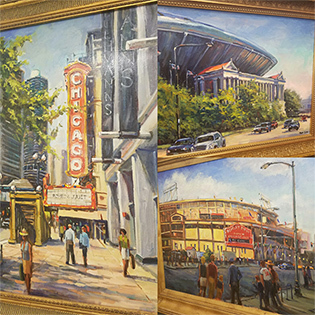 Enjoy colorful and engaging scenes of life in Barrington and many of Chicago's most iconic landmarks, in oil and watercolor by Mort Luby. Mort Luby has won more than 50 awards in national, regional, and local art competitions, including six best-of-show citations. He has twice won first place in Barrington’s “Art in Nature” show at Crabtree Forest Preserve. He studied art at the Universities of Wisconsin and Notre Dame, where he graduated with a degree in journalism in 1953. He has also studied at the Art Institute of Chicago, Scottsdale Artists School, and other leading art institutions. He has participated in workshops with America’s greatest artists, including Clyde Aspevig, Romel de la Torre, Phil Kantz, Charles Movali, David Demers, Kim English, Matt Smith, and others. “Chicago Brushstrokes,” a book with 100 of his paintings of the Windy City, has been sold at the Art Institute, the Architecture Foundation, the Chicago Historical Society, the bookstore at Willis Tower, and many other locations. The first edition sold out in less than two years. Luby’s paintings and book are featured in many nearby galleries and stores, including Algonquin’s Savour and Barrington’s Norton’s USA. Norton’s also produces an annual calendar of his watercolors. He is a featured artist in galleries operated by the Maui Hands company in Hawaii. 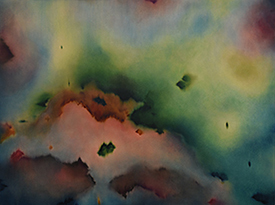 Luby paints watercolors and oils in his Dundee studio and in his part-time home on Maui. He is a member of the Plein Air Painters of Chicago, the Plein Air Painters of Hawaii, and the Palette and Chisel Academy in downtown Chicago. He began his full-time art career 20 years ago after retiring as CEO of Luby Publishing, a 103-year-old publisher of sports magazines headquartered in downtown Chicago. He was also a stringer for Associated Press for more than 40 years. Download the artist biography and price sheet for Mort Luby. These artists are a local, private group of friends. "Our mission is to educate and enrich community, support local business, and uplift local artists through our activism, volunteerism, networking, and communication." For contact and pricing information for the artwork, download this PDF. 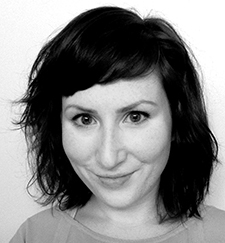 Sara E. Michaels got her start in the creative world at age five … with crayons. Since then, she’s upped her skills a wee bit (okay, hopefully more than “wee”) and works as a professional graphic designer. In her spare time, she does what she really loves; illustrates and writes children’s books and creates “friendlier” versions of her favorite films. Sara works with both traditional and digital media, typically drawing a detailed illustration with pencil first, then putting it into Photoshop or Corel Painter to bring it to life with color. 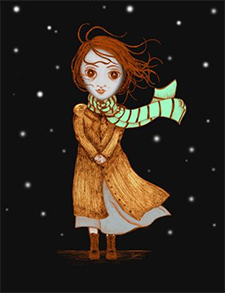 Her influences include Roald Dahl and Quentin Blake, Stephen King, and Grimm’s Fairy Tales. She lives in Worth, IL and sells her work through her Etsy shop. NEW! You can now buy a smaller (8.5" X 14") version of Sara's Barrington mural to color at home! The Decorative Arts Studio's artists, Meg Seier and Jim Marisie, met at Barrington High School. Both received scholarships to the Chicago Academy of Fine arts and completed their degrees at Columbia College. Both specialize in decorative art - from huge corporate murals to hand-painted silks, and a huge variety of designer finishes for interior decoration. Visit their studio at The Artifactural Furniture Building, 829 W. Northwest Highway in Barrington, or online in their Facebook page. 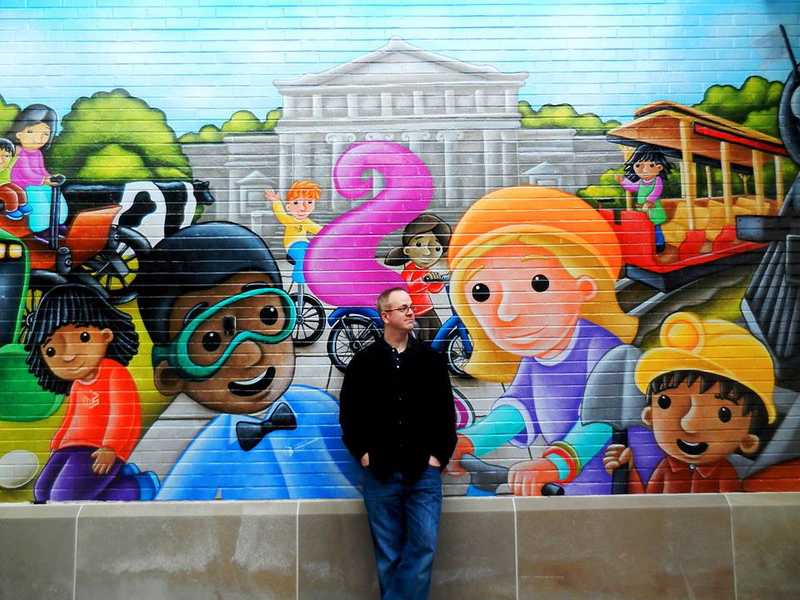 Kevin Luthardt is a painter, muralist, and author/illustrator of children’s picture books based in the Chicago area. He has written and/or illustrated 9 picture books, including WHEN EDGAR MET CECIL, LARABEE, and PEEP! He graduated from the University of Illinois at Champaign-Urbana with a BFA in painting. His original paintings are represented by Mars Gallery in Chicago. He has created more than 60 murals in Illinois and beyond. Kevin is committed to using his work to teach and inspire students of all ages. He visits around 30-40 schools, libraries and other venues each year as an author and artist. Kevin grew up not far from Barrington in Schaumburg, IL. He has lived in Skokie, IL, for the past 16 years with his wife and their four boys. He is happy to share his love of visual storytelling with the Barrington community. The paintings in this exhibition are all original illustrations from Kevin’s picture books. 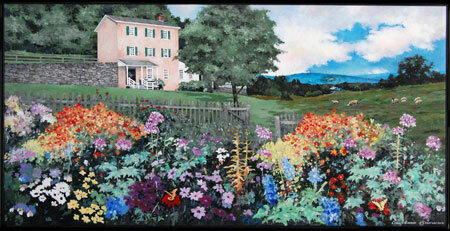 The paintings of Barrington artist Mary Waring Barnes. Mary Waring Barnes is a Barrington resident whose paintings have been shown and enjoyed in museums, galleries, and exhibits all over the United States. Waring Barnes studied painting at Bennington College and Bowling Green University, as well as with Fred Berger at the Evanston Art Center and Barnet Rubenstein at the School of the Museum of Fine Arts in Boston, MA. She has received numerous awards and honors and her work resides in many private collections. Her work is authentic, diverse, and surprising, and the Gallery in the Library is delighted to make it available to the Barrington area community. Art As Life: the Works of YoungSe Kim. 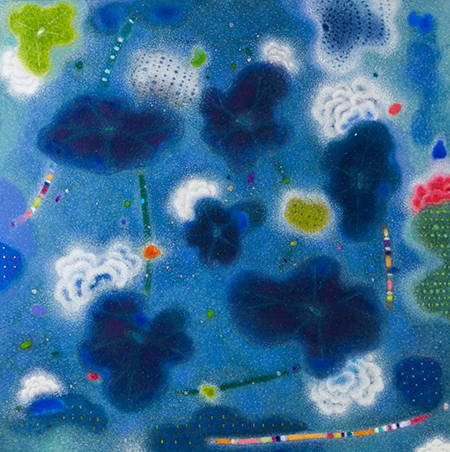 After receiving her BFA in Fabric Fine Arts from Hong-Ik University, Seoul, South Korea, YoungSe Kim has shown her highly unique and captivating artwork in solo and group shows from Korea to California to New York City. Her works are part of collections owned by the County of Los Angeles, California, and the Asian Pacific American Local Center of Southern California. 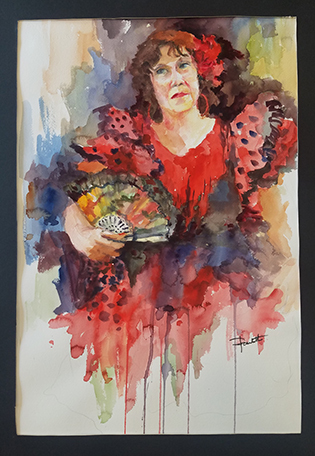 She is currently residing with her family in the Chicago suburban area, and the Barrington Area Library is delighted to share her works with visitors to the Gallery in the Library. To contact the artist or inquire about her work, please ask for an information sheet at the customer service desk or reference desks. I simply take this beauty and express it on my canvas. My art is not heavy with garish or high knowledge. My art is inclusive and approachable. The objects fade out, fade in - all have gradation, and feeling from color. The empty spaces are full of meaning. This is my way of laying out - not creating - beauty, which is so close to all of us. 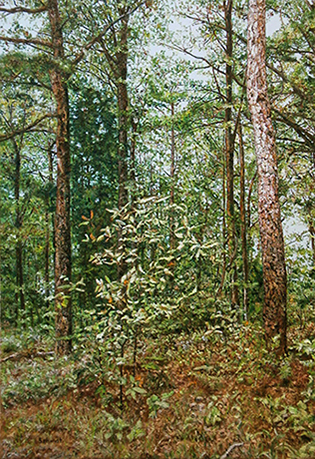 Carol's Garden by Roy Stafford, acrylic on canvas, 24" X 36"
"The interests that motivate my paintings derive from a love of God's creation and a closeness to nature from childhood. I am an environmentalist at heart and this has led to many landscapes created from resource photos and made into my own compositions for painting. As a photographer and artist I have been inspired by the photos I have taken over the years in the many travels with my wife. 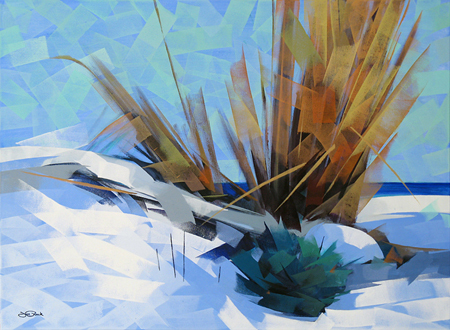 Many of my works reflect my love of the natural world." Roy Stafford has been a resident of Palatine, IL, since 1949. 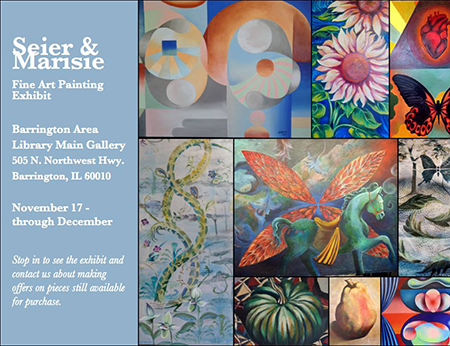 Exhibits: Countryside Art Gallery, Arlington Heights; Palatine Public Library; Arlington Heights Memorial Library; Barrington Cultural Arts Council. Joe Ruck is a painter and sculptor who lives and works in Rolling Meadows, IL. His bold paintings capture glimpses of life from the Chicagoland area. Using oil paints applied with a brayer (roller) he creates art using a tapestry of overlapping strokes. This unique impressionistic approach is eye- catching from a distance and intriguing up close. He received his formal training from the American Academy of Art in Chicago and attended workshops at The Palette and Chisel Academy in Chicago. Learn more at www.joeruck.com. From Ruck's website: "I'm grateful to be able to paint and sculpt and have always found satisfaction in both." "I grew up in the Chicagoland area with a mother who wove beautiful wall hangings, a father who sculpted in metal and friends who encouraged art experimentation. Enjoyment for me comes from exploring many different mediums and subject matter. Currently I am painting with a brayer (roller) and am amazed with the versatility of this tool. From broad blocks of color to rhythmic sweeping lines the brayer allows for a wonderful spontaneity." "My friends and family are very supportive of the arts especially my wife Kathy who always lends a helping hand at the art shows." 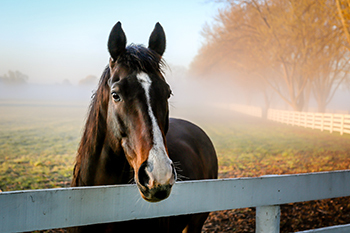 The Gallery in the Library is delighted to present works by poet and photographer Tobin Fraley, on exhibit from October 15, 2014 through early December 2014. The extraordinary exists in small spaces. The environments surrounding us on a daily basis contain reflections of the world as a whole and when we take these surroundings for granted, we lose track of the bits and pieces making up our lives. For the past fourteen years my photographic goal has been to explore areas that at first seem ordinary, but upon closer inspection, like looking at a bug’s face through a microscope, expose wondrous objects at every turn. Whether it is a hotel room in Fresno, the gutters of New Orleans, a street corner in downtown Chicago, or even one’s own backyard, there are intriguing stories to tell and exceptional designs everywhere I look. Born in 1951, Tobin Fraley spent his first ten years in Seattle, growing up in and around his grandfather’s amusement park. In 1962, the family moved to Berkeley, California, where Fraley soon discovered his father’s old 35mm Leica along with an enlarger and a few other bits and pieces of darkroom equipment. The political environment of Berkeley in 1960s offered him a chance to practice with the camera. A number of years later, he began to study photography in earnest. While living in New York, Fraley met professional photographer Bill Kane. Kane worked with Fraley on business projects and also shared his knowledge of the technical side of photography. Within a few years, Kane was pushing Fraley to work with the 4”x 5” camera under Kane's supervision. In 2000, Fraley and his wife Rachel moved to Long Grove, Illinois, in the Northwest suburbs of Chicago. They settled next to the Reed-Turner Woodland Nature Preserve and currently own and operate several shops in downtown Long Grove. He is the author of three books: on the history of carousels, a holiday children’s story titled A Humbug Christmas, and a written and photographic exploration of the Reed-Turner Woodland titled 36 Acres. Fraley sells his photography through a local gallery, he is a published poet, and he teaches photography at the Chicago Botanic Garden. 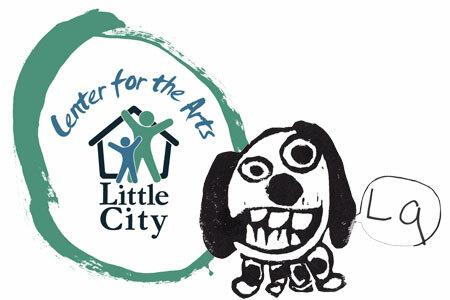 The Center for the Arts at Little City is the result of an evolutionary process that began with the belief that people with developmental disabilities could be taught skills that would lead to full opportunities in the arts. From a program that used cable television as a teaching tool for people with disabilities, creating programs that won prestigious regional and national awards, the program grew to a “best practice” model, one that is recognized nationally and by which others measure their achievement. Each day, professional artists acting as facilitators encourage artists to expand their reach and skills, resulting in art that transcends the disability of the artists who created it. Artists who cannot see, artists who do not speak and even artists who do not recognize the presence of others around them, are the painters, sculptors and designers at Little City who exhibit and sell their work competitively with others who do not face the same challenges. Little City strongly believes in empowering people with disabilities, to give them the education, training, skills and encouragement that enable them to reach beyond their current capabilities and become all that they could be. The agency does this by offering extensive programs and services to children and adults with autism and other intellectual and developmental disabilities. Andrea Bell is a fine artist who has lived at Little City for over 40 years. She joined the studio art program in January of 2000 and has been a prolific artist ever since. She immediately began using tempera paint, charcoal, and pastel to apply multiple layers of swirling circles upon her work surface. Upon completion, her circles seemed to dance upon the page, creating mesmerizing, rhythmic pieces of art. In recent years Bell’s work has become more refined and mature. Her palette has become more restrained and precise. She has added other motifs to join her signature swirls. Electrically vibrating parallel lines, grids of muscular, scrunched up circular shapes, and various collage elements regularly make their appearances. Andy has taken part in numerous group and solo shows both locally and nationally. Tarik’s stream-of-consciousness working method is often clearly perceivable in the finished artwork. Snippets of words, phrases and symbols will be spread across the surface of the page, but never in a uniform manner. Single words may stand out in isolation, while other words or phrases may flow over the page in a graceful arc, tracing the gestural action of the artist’s hand across the paper. The words themselves may be clustered around a theme. This is most apparent in works that incorporate collage materials. In Louisiana, a photo of a marching band has prompted Tarik to offer up such words as Jazz, and Blues. Even here however, Tarik has included other words which may have been lingering on his mind, such as Sun and Love. Tarik’s original works have been exhibited extensively and have been commissioned for both commercial textile designs and print publications. A prolific artist, Joe Flasch approaches the task of image making much like a Chinese calligrapher would. He has developed a collection of symbols, easily depicted in flowing brushstrokes, which function for him like pictograms. There are brush strokes that symbolize such things as trees and people. When the symbols for people are joined together, they represent families. Many of Flasch’s paintings, though appearing to be wholly abstract to the uninitiated, are actually depictions of such things as a family having a picnic in a park. When he paints Flasch likes to isolate himself at the back of the studio where he is free to apply his pigments with a certain verve and to get lost in his own world. The grace of his brushstrokes sometimes spills over into his reality, as he paints amid short episodes of twirling dance steps which compliment the looping marks which he is committing to canvas or paper. Flasch will proceed to repetitively fill his working surface with his brushstrokes/pictograms, switching forms as ideas occur to him, and varying sizes and occasionally colors. He goes on until he is satisfied with the finished effect. Given that his methods remain static, his overall body of work displays an astonishing degree of variety, with each new piece achieving new effects of texture, and relationships of form and color. Harold Jeffries’ imagery and working methods are an outgrowth of his personal obsessions and inner world. Nearly every piece has as its basis a gridwork of lines, forming squares, rectangles, circles and other forms which resemble an isolated section of a vast blueprint outlining some lost Minoan palace. If asked, Jeffries will tell you that these are indeed blueprints. They are part of his lifelong obsession to create blueprinted plans for Heaven. This project has no beginning, middle or end. The portion of the plans that Jeffries draws at any one time simply reflects his thoughts at that moment, and do not advance the project along any conceivable timeline, a fitting solution for planning what is infinite and eternal. Wayne Mazurek’s art is guided by his passions. 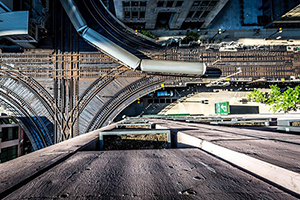 Intensely interested in cars, space travel, boats- indeed in all forms of transportation, as well as in urban planning and medieval times, he creates artwork that is almost exclusively devoted to these topics. It’s also his passion that drives him to research his art so diligently. He attends the auto show every year, as well as frequenting the local dealerships. He never misses any television offering on one of his pet subjects, and is constantly at the library finding new books that might stimulate his own imaginings. Fast and capable of creating easily perceived details, permanent markers are his medium of choice. His style is straight forward and lucid, the better to show off the “concepts” that each of his depictions represent. And make no mistake, each of Wayne’s pieces begins with a concept. When talking about his creations Wayne uses sentences that begin with phrases like, “What if there was a car that could. . .” or, “No one’s ever seen a ship with. . .“ He then proceeds to point out a dozen details in his current work that you might otherwise have missed, and which really do represent a breakthrough in car design, or urban planning, or whatever Wayne had bent his thoughts towards that day. Many times Wayne will present one of his concept vehicles alone, in silhouette on a white background. This often suffices for his purposes. But Wayne is also capable of creating complex scenes and narratives which support the inevitable depiction of the cars, trucks and space vehicles which populate these scenes. It is easy for a viewer to get lost inside of these works, with their inexhaustible supply of details and their fascinating interplay of shapes and colors. Wayne has been known to let his talent for building narrative foundations for his art spill over into his life. He has designed and assembled a suit of armor and intricate, medieval looking weapons which he sometimes wears to the art studio, where he will calmly sit down, without making or expecting any reference to his attire, and create art. He doesn’t need to be wearing his armor in order to sign his works “Sir Wayne”, however. Luke Tauber’s artistic output has, for the last several years, closely reflected a short list of his personal obsessions. He continues to work on a series of projects about classical composers, the artist’s deceased family members, and Western funeral practices. Of particular interest to him are the composers Beethoven, Bach, Mozart, Schubert, and Schumann. Tauber has extensively researched their lives, musical works and deaths and has crafted elaborate reconstructions of the composers’ mausoleums and grave sites through watercolor and ink drawings, as well as painted cardboard sculptures. For the past several years, Tauber has been working on a life size model of Beethoven’s body along with charts that contemplate what Beethoven might have had to eat and drink just before his death. Deceased family members are often memorialized alongside the composers. Tauber was born in Germany in 1946, in a deportation camp, where having survived the Holocaust, his parents awaited their opportunity to immigrate to the United States. In a series of vibrant watercolors, Tauber has depicted the graves of his mother and father in the Evergreen cemetery in Arizona, as well as the grave of Beethoven in Vienna. Tauber works in a variety of media including sculpture, painting, drawing, artist books, sound, digital photography, and video. He has just concluded one-man installations at the Flaxman Library at the School of the Art Institute, Chicago, and at Dittmar Gallery at Northwestern University, Evanston, IL. 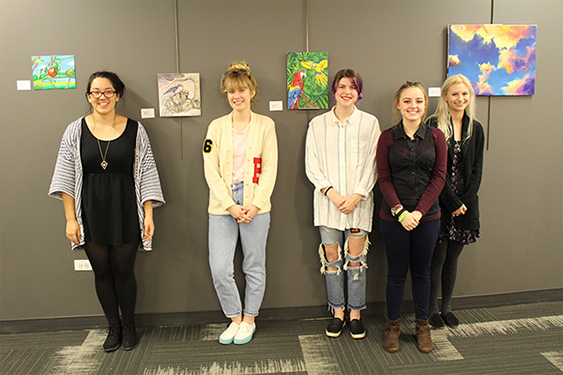 June - August 15, 2014: In celebration of the Barrington Area Library's complete renovation, the Gallery in the Library brought back select works by some of the most popular artists to exhibit here in the past. Paintings by Kathleen Eaton, Bruno Vanoudenhove, and Lou Taylor were featured, along with photography by Barbara Pintozzi and former Gallery co-curators Kelly Stachura and Lisa Swarbrick.